Apple has finally updated its pro photo management app, Aperture, to version 3, and there’s something in this new release for every level of photographer—Apple says Aperture has over 200 new features. There are features that have been long awaited and mysteriously absent from previous versions, like a curves adjustment tool. There are iPhoto ( ) carryovers, like Faces, and there are scores of new additions aimed at making the sometimes tortuous workflow of photo management and RAW processing as painless as possible. This review covers some of my favorite features, as well as issues that some Aperture users have experienced. One thing is clear in this new release: Apple wants to entice amateur photographers to step up from iPhoto, but they don’t want to alienate the pros. To do this, Aperture 3 now has new ways to organize images using Faces (based on image analysis and user input) and Places (based on geographic location information), both of which will be familiar to iPhoto users. Places can be used to link images to a map of the world; the map has various levels of magnification, and an ever-growing, impressive database of worldwide locations. It’s incredibly easy to drop images right onto the map to assign a location, or import and link GPS data to images in a project. If you already use Aperture 2 ( ) with a large library, when you upgrade it can take Faces a long time to churn through the image analysis for the first time. With my library of 20,000-plus Canon 5D RAW images, it took about 24 consecutive hours on a 2.16GHz Core 2 Duo iMac with 4GB of RAM. A hint: Turning off Faces can make Aperture’s performance snappier. These features are fine and make it easier to locate specific images hidden in large photo libraries. But for most pros (myself included), neither is going to dramatically improve workflow. Aperture now has a curves adjustment—that’s what excites me most about Aperture 3, considering that curves (though it can be difficult to master) is probably the single most powerful adjustment tool in professional digital photography. It can punch up colors, put contrast in the right places, and add pop to even the most stubborn of shots. Better yet, Apple’s implementation of it here is brilliant, with the ability to focus in on the shadow part of the range, zoom out to an expanded view, and even create multiple curves adjustments for a single image. But curves is just the beginning of how Aperture’s adjustments have changed. There are 14 new Quick Brushes tools that let you non-destructively paint in adjustments like Skin Smoothing, Contrast, Halo Reduction, Noise Reduction, etc. In addition, many of the normal adjustments can now be brushed in or out, not just applied globally. This approach is much better than having to round-trip an image into an external editor like Photoshop—adding the Photoshop file to Aperture takes up a lot of disk space, while image edits performed in Aperture are stored as space-saving metadata. A series of preset adjustments (from simple exposure fixes, to sepia filters, to basic cross processing) and the ability for users to make their own presets, is a nice touch for pros and amateurs alike. 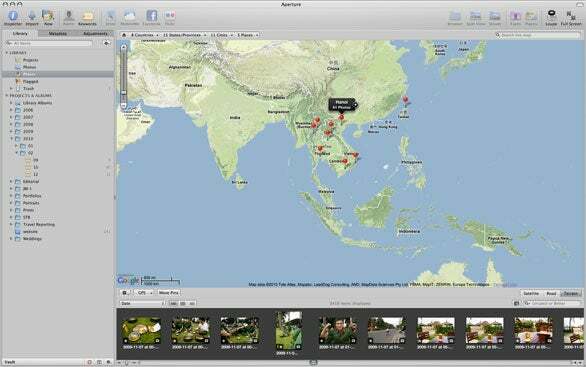 The new Places feature in Aperture 3 allows for multiple ways to organize your images based on location, by dragging and dropping images directly onto a map, or by linking to imported GPS data-sets. Another nice improvement is the quality of Aperture’s new Raw decoder. To my eyes, the new decoder produces better noise profiles (mainly less chroma noise, and more film-like luminance noise), more natural colors, and is an overall improvement. Your existing Raw files need to be reprocesses by the new Raw decoder If you want to use the new adjustment tools. This is all great news, but I’m puzzled why I can’t group adjustments in order to brush in an area of the photo just once and apply multiple adjustments to that area. It’s common for portrait photographers, for example, to sharpen, brighten, and increase contrast on their subject’s eyes, but with the current system you have to brush in those adjustments separately. Another thing missing is the ability for third-party companies to access the non-destructive Raw pipeline for its plug-ins. The implementation of the Curves adjustment in Aperture 3 is intelligent, letting users see an expanded range, focus in on shadows, or work in the normal curves range. Aperture 3 also lets users brush in curves adjustments, or apply more than one curves adjustment to an image. My experience with Aperture 3 has been mostly smooth, with a few hiccups. Many bloggers, people posting to Aperture’s Apple-hosted support forum, and even a few Macworld editors and contributors had reported sporadic crashes, slow-downs, and buggy behavior with the new release. To address these problems, Apple released the Aperture 3.0.1 update and the ProKit 5.1 update. The updates fixed performance and stability problems that Macworld editors experienced. It is worth noting that updating older libraries to Aperture 3’s new Raw decoder en masse can take a while, and according to the chatter online has been associated with some of the problems folks are experiencing (the update fixes most of the importing issues). For this reason, and the fact that reprocessing older images into the Aperture 3 Raw decoder may alter the adjusted look of an image, on the first launch of Aperture 3 you might want to uncheck the dialogue box that offers to reprocess all your images (even with this unchecked, Aperture will still take some time to update your library so it is compatible), and instead reprocess on an image-by-image or project-by-project basis as needed. In addition, unlike previous versions of Aperture, once you reprocess using the new decoder (which is necessary to access some of the new adjustment bricks and image-quality improvements), you can’t go back to the old Raw decoder. You can, however, make a new version of an image to reprocess while leaving the original version as it was before updating. 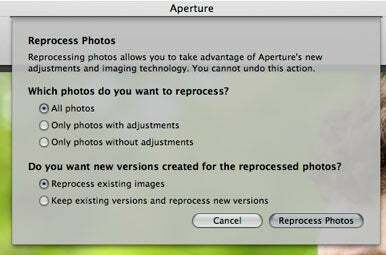 If you right-click an image brought in from an older version of Aperture, and choose the option to reprocess the image using Aperture 3's RAW pipeline, you'll be given the option of creating a new version, and leaving the original version in the old decoder. Since this is a major upgrade, it’s a good idea to have multiple backups of your old library, and bring in images to Aperture 3 slowly. At the end of the release notes for the Aperture 3.0.1 update are some tips you should follow before upgrading your Aperture library. Aperture 3 adds new features that will impress both amateurs and professionals, and make image organization, editing, and sharing easier. But as is the case with software aimed primarily at pro users, Aperture 3 takes a powerful computer to get the most out of it. For users of Aperture 2, updating to the new version could be well worth the price—you might want to wait until Apple releases a 3.1 update to address the stability issues (though as noted above, the 3.0.1 update worked well to solve the issues Macworld editors had with version 3.0). Some iPhoto users will want to upgrade, but many will likely find that Aperture has more features and is a bit too complex for their day-to-day needs.